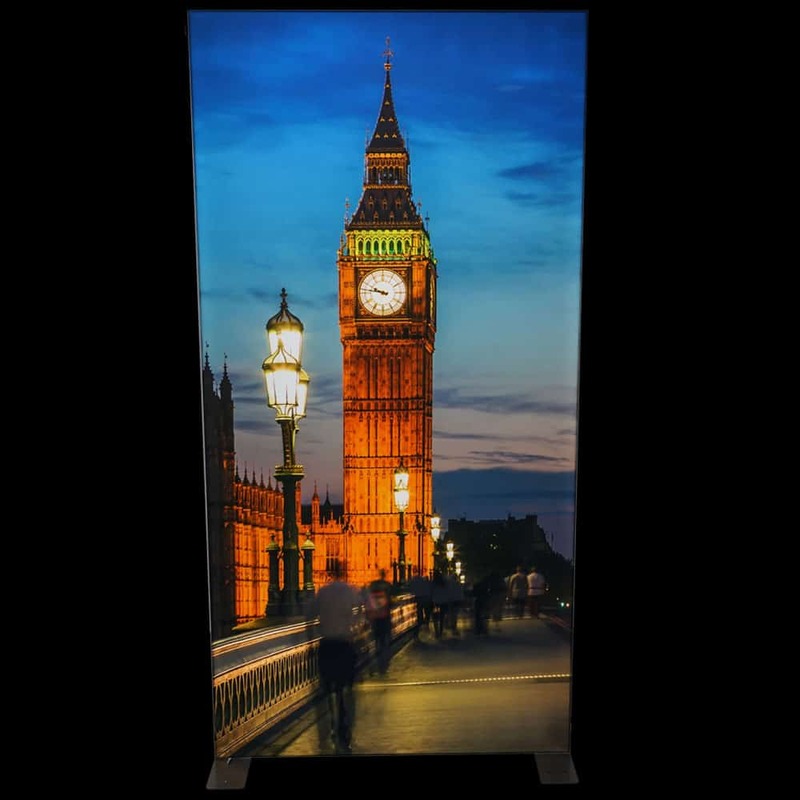 Our tension fabric light box displays are an ideal solution for stunning, vibrant backlit or edge-lit displays. 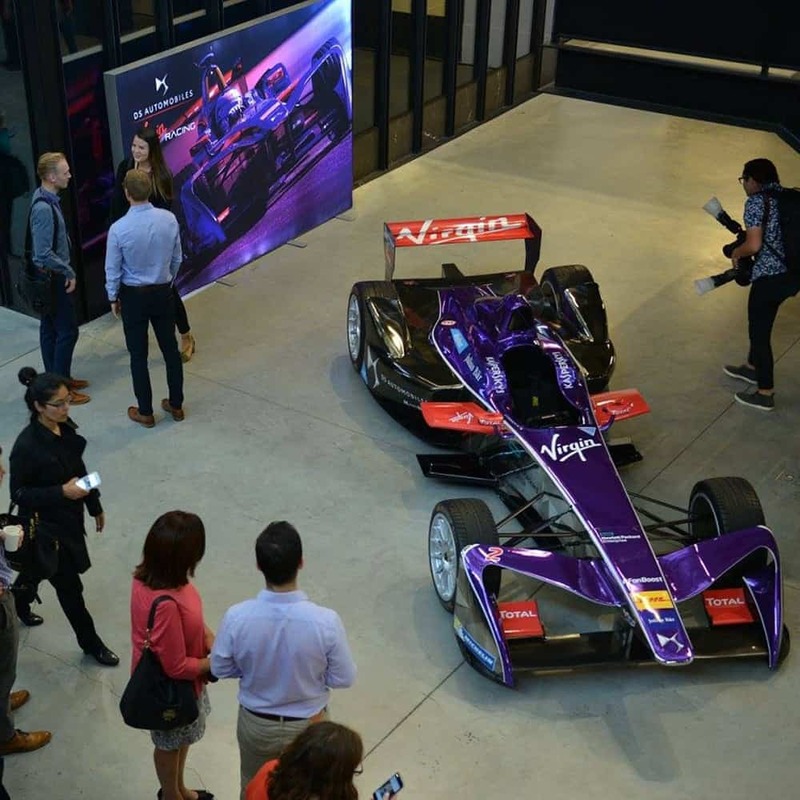 Featuring easily interchangeable tension fabric graphics and high quality designed and manufactured aluminium framing, these can be supplied in a range of standard sizes or can be custom manufactured to suit your exact requirements. 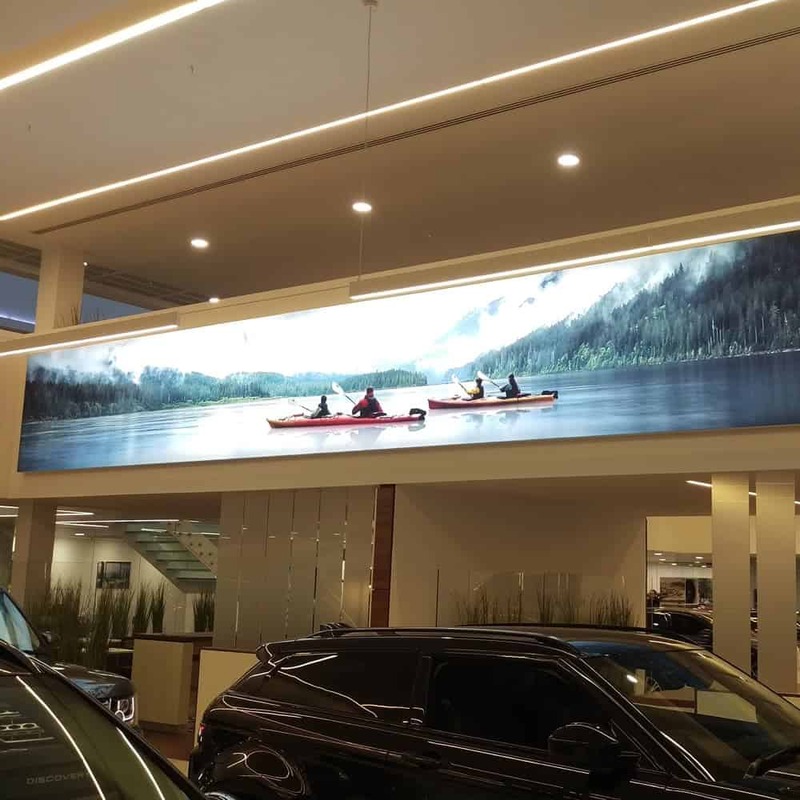 Tension fabric light box display systems are ideal for wall-mounted, freestanding or hanging applications and are perfect for window displays, retail, architectural, exhibition displays and stands, showroom and reception areas or any public space. All lightboxes are custom made to order. Freestanding lightboxes have additional feet allowing them to stand safely and can also be anchored down as required. Using silicone edge graphics (SEG) you can easily switch between single and double-sided applications. 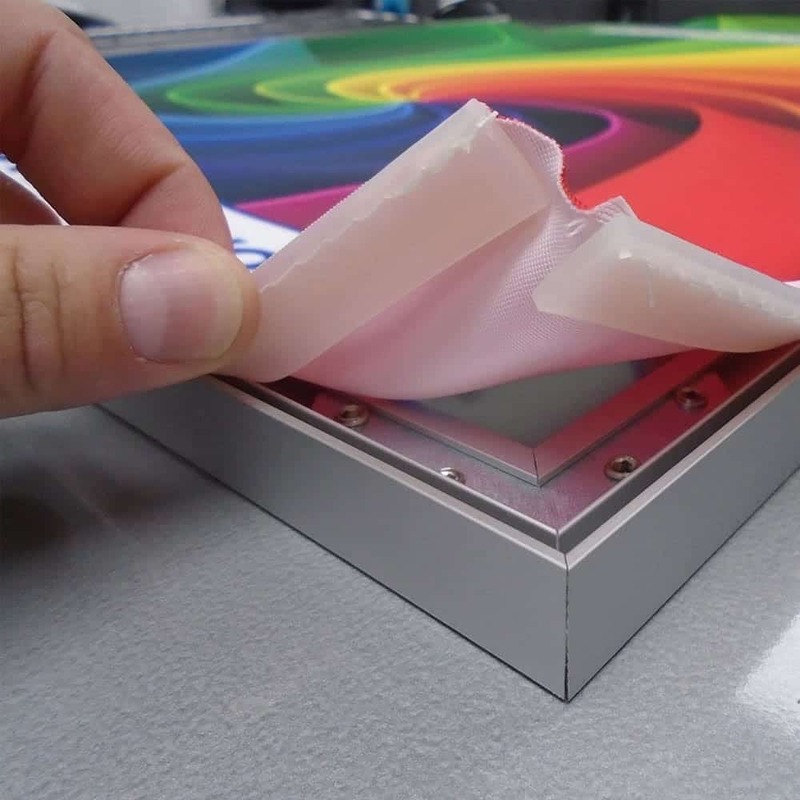 Wall mounted tension fabric lightboxes use silicone edge tension graphics (SEG) to give a seamless edge to edge finish. 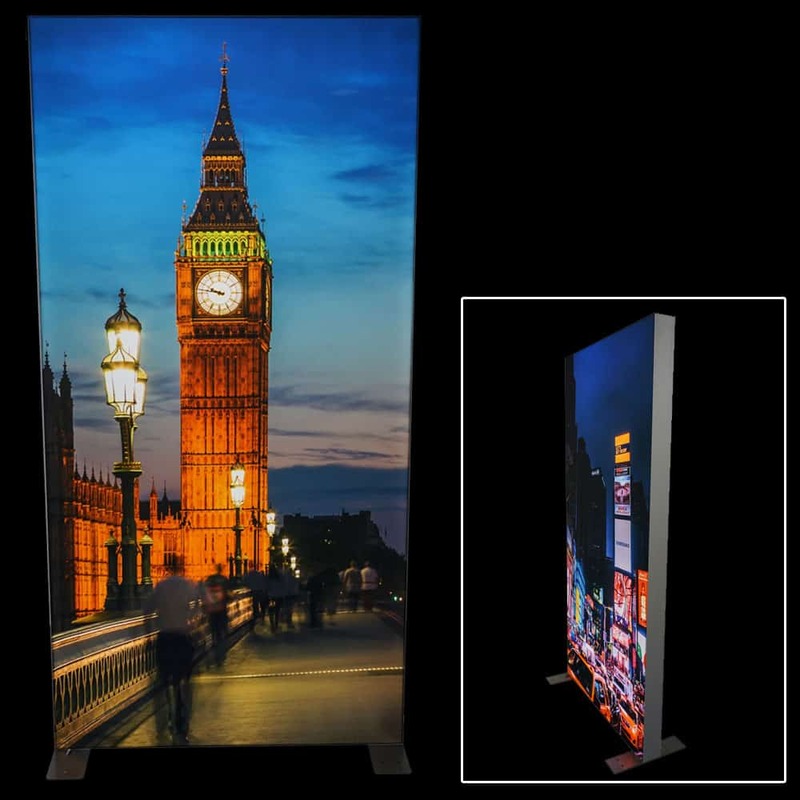 Ideal for exhibitions, retail or commercial environments. Available in edgelit or backlit configurations. Hanging lightboxes are ideal for exhibition spaces or retail environments. 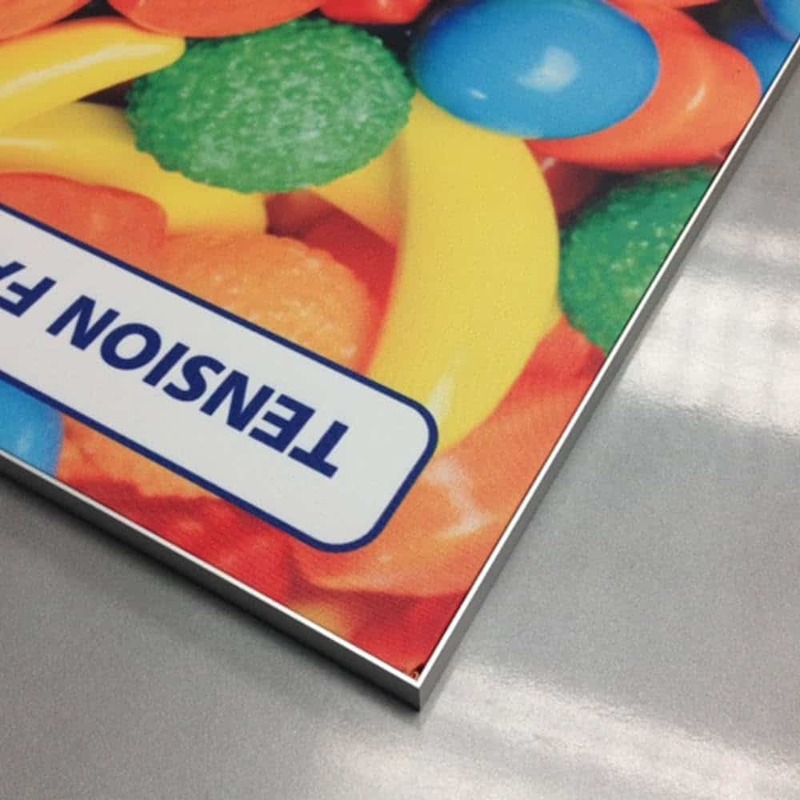 Being double-sided they offer maximum advertising space using silicone edge graphics (SEG). We can supply with eye bolts for safe hanging. 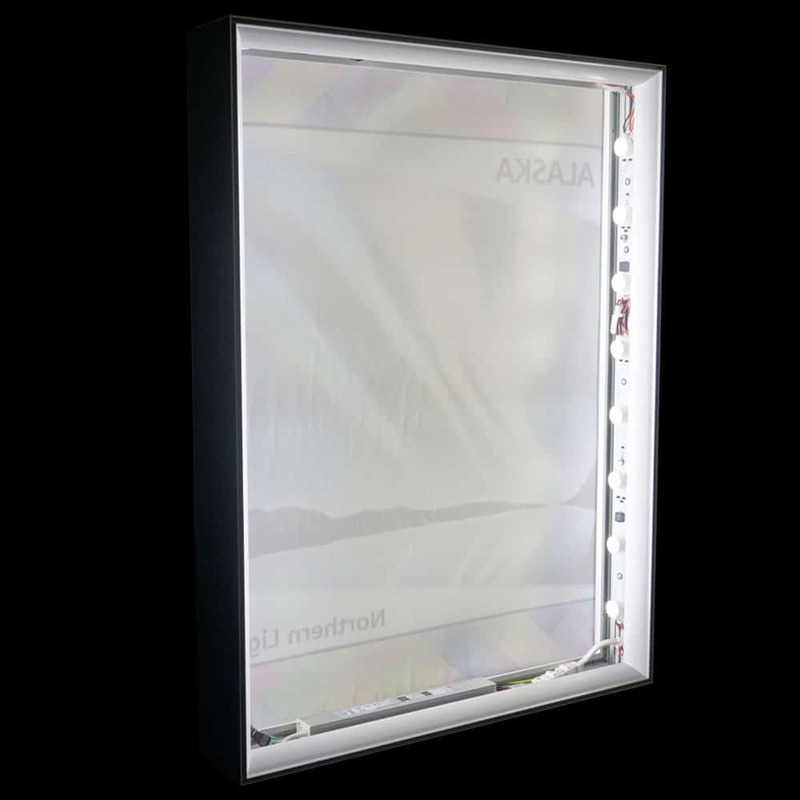 Our lightboxes are available in both edgelit and backlit options, with a standard frame extrusion depth of 100mm which is constructed from anodised aluminium. We also offer a ‘White’ finish, or for bulk orders, we can offer powder coating options. Please contact us for more information. The internal power supplies can be positioned in such a way that the external power lead exit point can be specified at time of order. LEDs are placed around the perimeter of the lightbox and shine sideways through behind your fabric graphic panel. There are fewer LEDs required for complete illumination, which will, in turn, lower your production and running costs. Edgelit lightboxes are ideal for single or double-sided applications up to 2.5m high by any width. 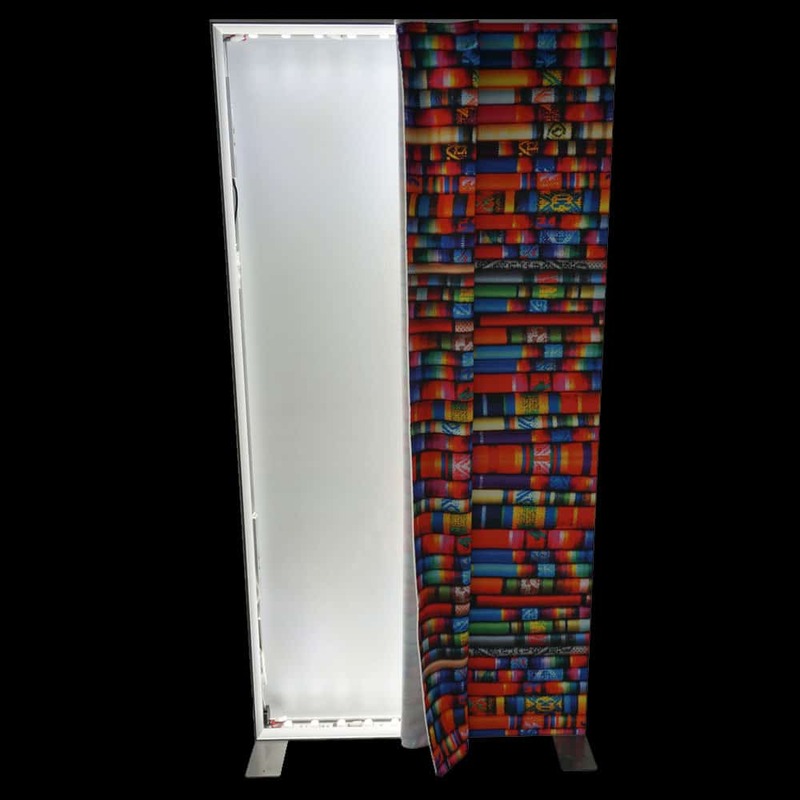 Backlit lightboxes feature LEDs across the whole back panel, facing towards your fabric graphic. 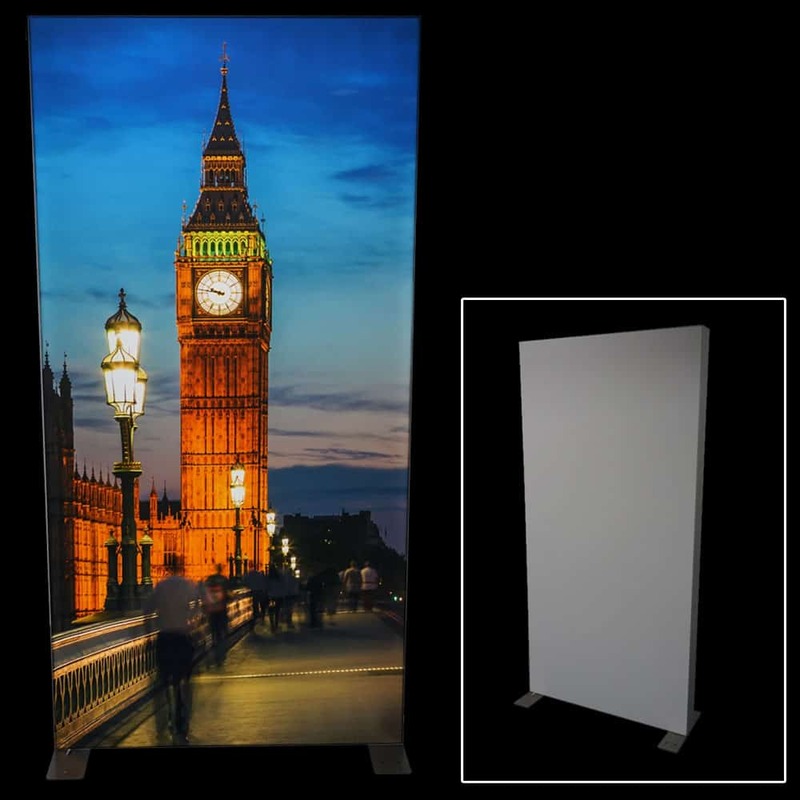 Ideal for larger wall mounted applications up to 3m high by any width. This lightbox features a unique installation system, which allows the back panel to be retro fitted or replaced without the need to remove the lightbox from the wall. We have different fabric options depending on your application. 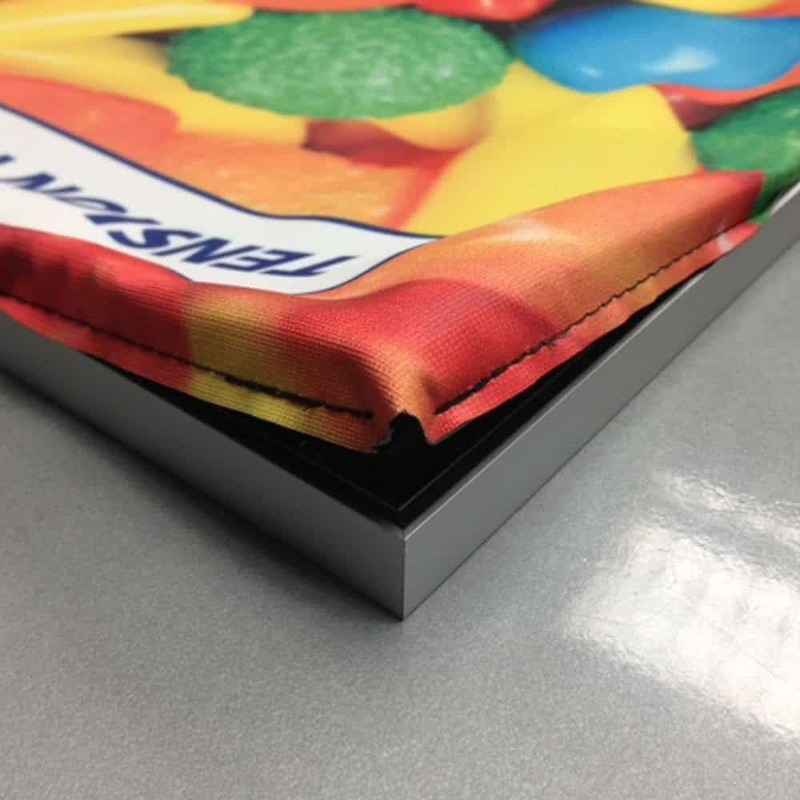 Our Blockout Display Fabric is a lightweight 100% polyester textile with a PU blockout backing. 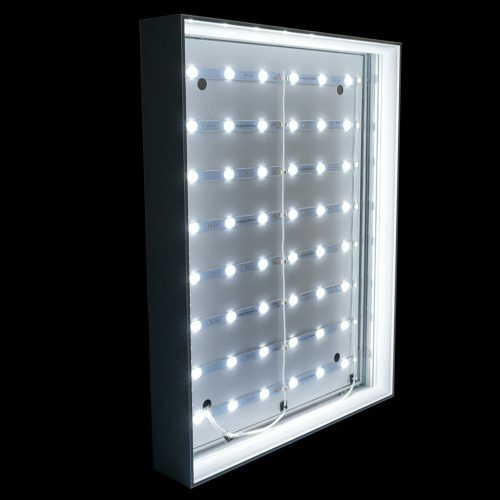 This ensures all the illumination is directed to the front of your lightbox display. As you can see from the image to the far right (Blockout), the edgelit lightbox is turned on and lighting is visible on the left of the box, whereas the fabric covering the right hand side is blocking the light. Unlike the first image (Backlit) where you can see the light coming through highlighting areas of the image, such as the street lamps and the clock face. If you hover over the image, it also highlights the advertising screens within the New York Time Square scene. TFS stands for Tension Fabric System, also known as SEG (Silicone Edge Graphics). Tension Fabric Systems are an ideal solution for retail, commercial, architectural, exhibition and display environments. Systems can be tailored to your requirements using re-configurable frame components and are easy to install, dismantle and transport often requiring no or few tools for assembly. 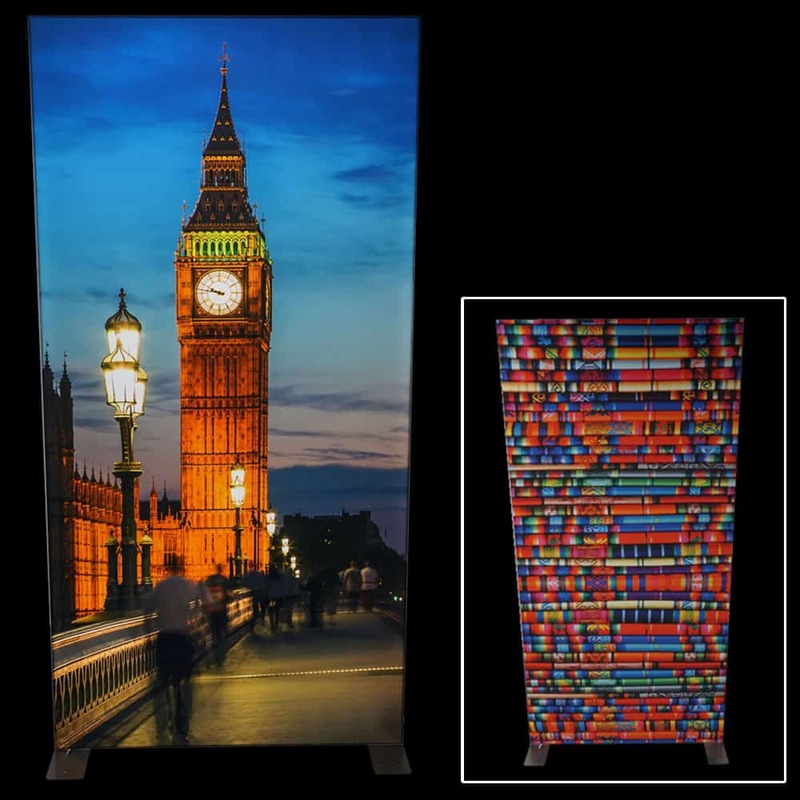 The graphics are a printed fabric finished with a silicon edge, sewn neatly around the edges fit in to a recessed groove within the frame that then stretches the graphic across the display. The result gives you a smooth and high-quality finish that brings your graphic to life. 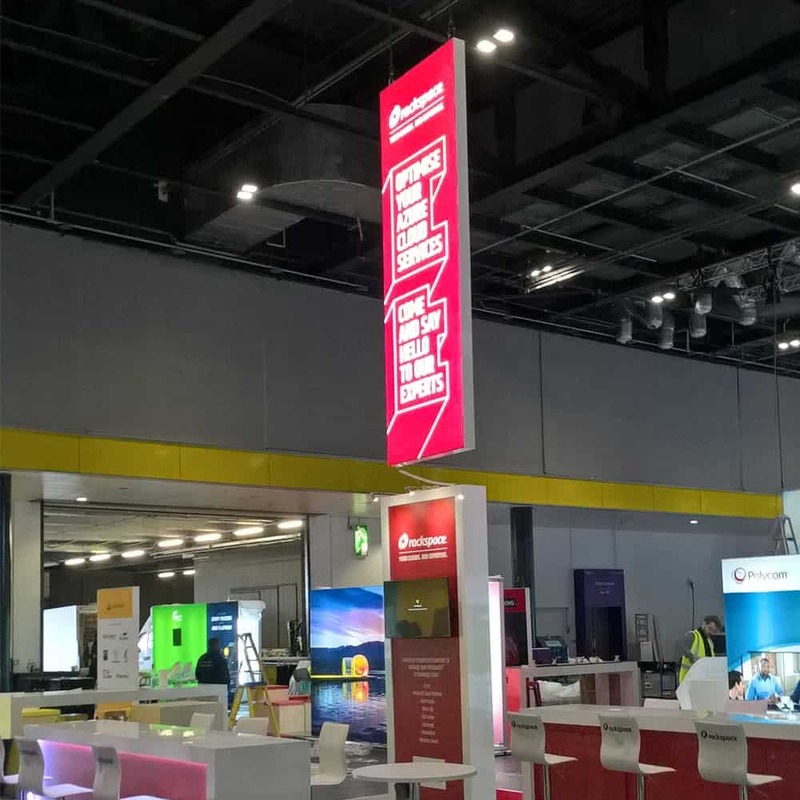 Wall mounted, freestanding, hanging systems are available along with light boxes and we offer a range of fabric options including frontlit, backlit and blockout. For more information please contact us by calling 01280 707180 or emailing sales@xg-group.co.uk with your requirements.